The beauty of watching flowers bloom and the intoxication of their scents always fills one when walking through a garden. The relaxation and bliss botanicals bring to you do not need to be abandoned as you leave the garden. Merrily Made by Merrie pens have captured nature’s beauty, so that all everywhere can share those magical moments. The creator, Merrie Buchsbaum, captures those fairy tale moments she feels while walking through her gardens into her pens. She makes her handmade hydrangea, lavender and watermelon pens from the hydrangeas, lavenders and watermelons she grows in her garden. Once she has harvested and dried the flowers and fruit, she carefully crushes them and mixes them with resin, which is then made into the pen. The color and texture of the pen comes directly from these freshly grown flowers and fruit. The magical feeling that the beauty of a flourishing garden gives you is now available at your fingertips. Merrily Made by Merrie pens come in lavender, hydrangea and watermelon and have accompanying journals that coordinate with the pens. The beauty of watching flowers bloom and the intoxication of their scents always fills one when walking through a garden. The relaxation and bliss botanicals bring to you do not need to be abandoned as you leave the garden. Merrily Made by Merrie pens have captured nature’s beauty, so that all everywhere can share those magical moments. The creator, Merrie Buchsbaum, captures those fairy tale moments she feels while walking through her gardens into her pens. She makes her handmade hydrangea, lavender and watermelon pens from the hydrangeas, lavenders and watermelons she grows in her garden. Once she has harvested and dried the flowers and fruit, she carefully crushes them and mixes them with resin, which is then made into the pen. 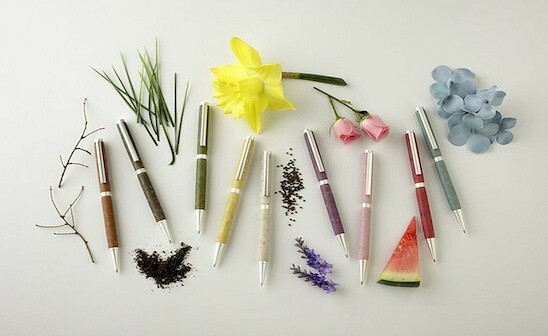 The color and texture of the pen comes directly from these freshly grown flowers and fruit.